New device development doesn't always start out with a single clean vision of the final product. Often the product is a bit fuzzy because the knowledge of all the capabilities is uncertain. There can be different visions fragmented by the different domains. 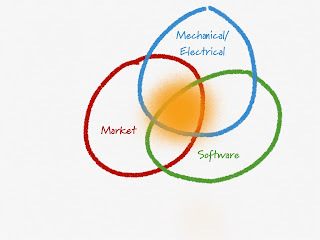 For example, marketing's vision isn't the same as the vision from software engineering, which is different from electrical/mechanical engineering's vision. There are unknown areas of overlap as well as areas of non-overlap. Can we put the capabilities into a small enough package to be marketable? Will the necessary processing power allow our cost, battery duration and heat dissipation to be below an acceptable level? There are many mutually dependent questions that need to be answered and some are critical. How many products have you seen that have failed because, although they may have done most things right, they did a few crucial things wrong (like battery life). Unfortunately for hardware-based products, we usually can't iterate rapidly on the entire product from the start, at least not well enough to discover these issues. We still want a cross-discipline approach to our vision, even if development doesn't support it. new product, for example the first generation iPod. 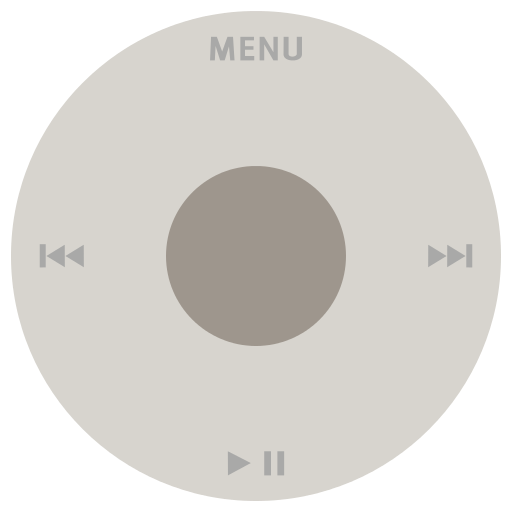 A key technical development that allowed the iPod was the famous "click wheel". The click wheel allowed for a tactile intuitive user interface. It was a big part of the iPod's success, but not the only part. The design aesthetic, storage space and battery life were all part of the device's success. (note: although Apple has been a client of mine, I did not work with the iPod team or know anything about the iPod development. This example is speculative or based on published descriptions from employees). Before the iPod, the market for mp3 players was saturated by hard-to-use, cheap players. The vision for the iPod started by addressing what the current market lacked. So the team explored design aesthetics, batteries, small, high-capacity storage devices and interfaces. All of these areas of exploration overlapped with the vision of a small, easy-to-use player that could store many songs and which the user would be proud to own. There was a certain amount of research that went into exploring each area of the iPod. 1.8 inch hard drives had been out for awhile, but newer 1-inch drives showed promise eventually. Cost and capacity factors led to the 1.8-inch drives being chosen. This had an impact on all the other areas. So how do we work with separate groups researching separate areas of a new device, when it's too early to precisely define the device and impractical to iterate on a nearly-shippable version? We can't have "potentially shippable" versions of the device every 1-3 weeks. We often don't have a clear vision of the device we want to build until we do some research. Stakeholders can be very nervous that research is open-ended and want detailed plans. Researchers have trouble fitting their efforts into 1-3 week time-boxes that produce something that meets a "definition of done". Stakeholders: We don't want to have open-ended research with no end in sight. We want to use more traditional project management techniques to put limits on the cost and time spent. We need more control on a day-to-day basis. Researchers: We can't estimate iterations. They are too short to produce any "valuable" result that meets any definition of done. Research has to align with the ultimate product's vision. But sometimes a single product's vision depends on the results of research. How do we reconcile these mutually dependent things? Check out some of the pitch videos made for crowd-sourcing campaigns. Many of these show what their devices might look like and how they would be used so they generate enough excitement to draw millions of dollars of funding. Isn't that level of excitement as valuable for those making your product? Spikes are user stories that limit the amount of time spent working on them. They also are meant to produce knowledge that can't be estimated in scope up front. We believe that implementing algorithm X will result in sufficient accuracy. We will know we succeeded when we get 95% accuracy from our test data in the lab. 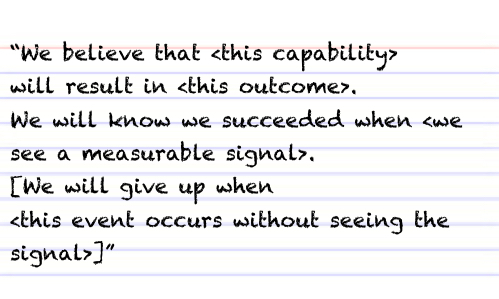 We will give up when we spend a full sprint without seeing this accuracy improve beyond 50%". 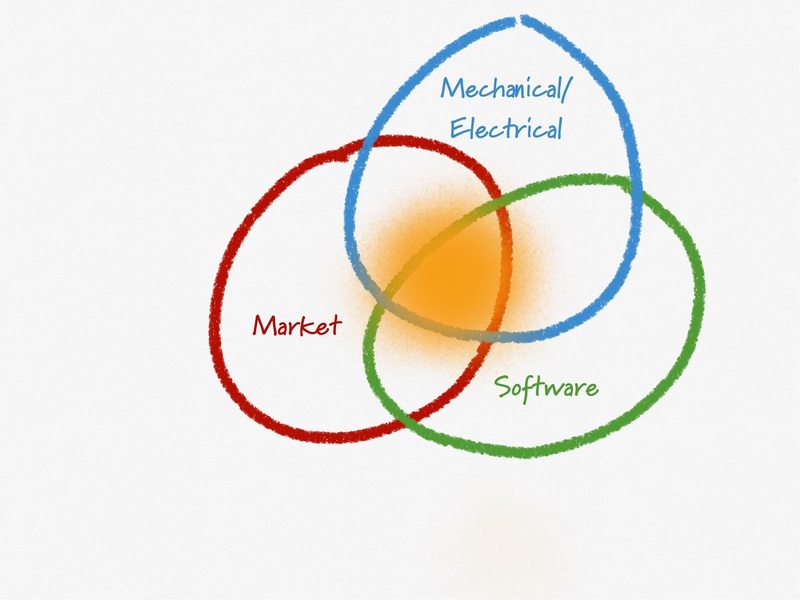 The approach is to explore an emerging product vision by exploring the range of separate domains and areas they overlap (orange area). The idea is for research activities to refine the entire domain and converge on the best-shared solution. This is fundamentally different from "point-based design" where the solution is chosen up front and the domains are forced to implement that point. Knowledge of what works and what doesn't usually emerges as deviations from the point-based plan and considered as negative impacts to cost or schedule. For example, suppose the iPod team had decided that the first iPod would have a touch-screen driven interface with solid state memory. That's a potentially better product than the first generation iPod (in fact it's what the iPod eventually became), but in 2001, due to the existing technology, the memory may have been limited and the touch screen too battery draining. Having gone down the long path of designing this device, Apple might have released a compromised or much-delayed product. Set-based design can cost more in the short-term, but it can save your product in the long term. To illustrate, if we had several contenders for a technical solution--all with various risks and costs associated--how would we work? If each took a month to evaluate, we could be pushing out the ship date by many more months. The answer is to research the solutions in parallel and to focus on failing each fast. For the example of a touch-screen vs. click wheel on the first iPod, we'd focus on the areas of risk first. How does each feel? What is the cost of implementing each? What is the power consumption? We'd try to get these answers addressed before making any further decisions (an iPod example is the creation of dozens of prototype cases, which Steve Jobs would choose from). This tactic of avoid decisions made without sufficient knowledge is referred to as "deferring solutions until the last responsible moment". We make better decisions when we know more, but we don't want to be in manufacturing when we decide to change the case. These days, with on-demand rapid prototyping, 3D printing, emulation, etc. we can shorten the experimental cycle on hardware dramatically allowing us to do set-based design far more effectively. Imagine we are playing the high/low game, where I have secret number, between 0 and 100, that you must discover by guessing numbers and having me tell you whether your guess is higher or lower than my secret number. What do you usually guess first? '50'. How many times is '50' the right answer? Never! So why do you guess it? You guess '50' because it gives you the most information about what range my secret number is in. It eliminates 50 numbers with a single guess. No other guess eliminates an equal amount of numbers. You didn't guess '50' because you thought it was the right answer. The same goes for research. We don't aim for the right solution, but the one that gives us the most knowledge in the solution domain. We setup our experiments to give us this knowledge as quickly as possible. 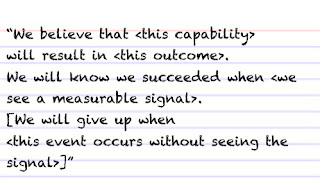 When we aim for the right answer, it often takes longer to plan and execute. Given our game above, it would be like taking 10-minutes to analyze the likely correct answer to the secret number from 0 to 100 and then announcing that '38' is the correct choice. It's just as likely to be wrong and gives us less knowledge than the '50' guess. A project to create and ship a new device will change states and practices as it progresses. Work will transition from researching foundation forms and technologies to prototyping the whole device to designing the production flow and moving into production. These are stages can't be combined into each iteration as well as software-only products can, but the traditional problems that stage-gate development encounters can be mitigated with lean practices (this will be addressed in future articles). The emerging vision of the device and the knowledge of what's possible will lead to the identification of a series of dependent activities or goals that need to occur before the device is ready for the prototype of production stage. Identifying these paths and focusing efforts on improving flow through them starts early. When designing the Prius, Toyota didn't decide on a hybrid engine at the start. They didn't know whether an all-electric, super-efficient gasoline or hybrid engine would be marketable (the "green market" wanted something environmentally friendly (efficient) and affordable). So they started three parallel research projects. The all-electric engine experiment showed that the cost of such a vehicle was too high. The efficient gasoline engine was low cost, but didn't hit the efficiency that the market wanted. The hybrid engine experiment satisfied both aims. As a result, the Prius, a revolutionary vehicle, was designed in half the time it took to design a conventional vehicle. Having a number of independent fail-fast experiments can be a cultural challenge. It can be hard to convince the bean-counters that is actually cost-efficient. Many advances in hardware development practices (such as 3D printing, field-programmable gate arrays, etc.) have allowed teams developing hardware to benefit from the practices that software developers have been exploring for over a decade. While iterating on an electrical or mechanical feature isn't as rapid as recompiling code, it's allowing more and more iteration and exploration into making better products. It's a challenge in some organizations to admit that "you don't know" the solution to a problem. It can easier to design a solution and, when it fails months later, blame it on the implementers. Companies that embrace risk, learning and transparency have a better chance at creating revolutionary products.